I didn't read this book, so I have no way of knowing whether it is well-written, well-illustrated or worthy of attention. I also have no way of knowing how the four committees that honored this book - those for the Coretta Scott King (Author) Book Award, the Printz Award, the Sibert Informational Book Award, and the YALSA Award for excellence in young-adult nonfiction - arrived at their decision. But there is no denying how it looks. These decisions were finalized during ALA Midwinter, just after the author of March: Book Three, Rep. John Lewis, had a highly publicized clash with President Trump. If only one or two committees had honored this book, I might buy that it was based on its merits. But four? And in a time when many ALA members are advocating for librarians to resist the "fascist" Trump administration? I have a hard time believing these decisions were not politically motivated. I was actually getting worried as I watched that this book might also win the Newbery and/or the Caldecott, but thankfully, we were spared that much. Still, this was a major disappointment, not because I have any particular feelings about the book, but because I'm growing increasingly disgusted with the library profession and its politics. I was hoping to see Ghost and Wolf Hollow recognized, and I got half of what I wanted. Wolf Hollow is absolutely deserving of its honor, and I was pleased that it was not overlooked. Ghost only won one award, the Odyssey, for its audiobook adaptation, but it was not recognized by the Newbery committee, which was too bad. The Girl Who Drank the Moon, which I did not read, was the winner. I can't say that it isn't good without reading it, but the description of the book is full of cliches and I don't think I'm going to bother. I've also been wading through The Inquisitor's Tale, one of the other honors, and it's a three-star book at best. I want to save my comments for my review, but the book relies heavily on toilet humor, and we all know how I feel about that. I mentioned in my review of They All Saw A Cat that I expected it to be given at least an honor. As I said I would be, I'm disappointed that this prediction came true. Yes, the artwork is interesting and different, but I'm still not convinced it really adds up to a compelling story. Du Iz Tak? also received an honor, and that was even more disappointing. I have yet to read a review of this book that explains precisely why it is so good. Everyone talks about the brilliance of the made-up language, but no one gets much beyond that one gimmick. The book is weird; that doesn't automatically make it good. I really believe a lot of people claim to like it because they don't want to admit they don't get it. As for the winner, it was a picture book biography of someone I've never heard of. If I happen to see it, I'll read it, but it's not the kind of thing I will seek out on my own. Elephant and Piggie still wormed their way in there, even though their series is over. It's really time to move on. Good Night Owl is about an owl going to bed at night. That drives me nuts. When I was 15, I happened upon Sarah Dessen's That Summer in the young adult section of my small-town public library and immediately fell in love. I wrote her a letter, to which she sent a wonderfully kind hand-written reply, and I have been a fan ever since. I met her once at BEA and saw her speak again at the DC Public Library, and I have read every one of her books. Since she has never won any ALA awards before, she wasn't really on my radar as someone who might be considered for something like the Margaret A. Edwards award. So I was surprised and thrilled to hear her name read out, and to see that the titles for which she was honored include Keeping the Moon, one of my all-time favorites. This was the highlight of the award announcements for me, and it has made me want to re-read some of her older titles before her newest comes out this summer. Were you pleased with the award announcements? 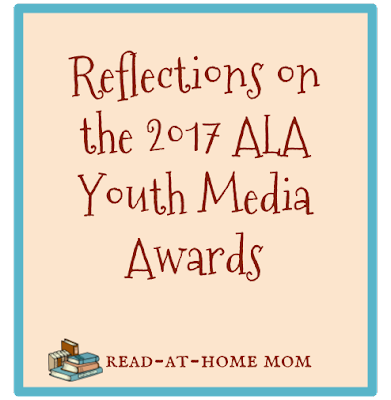 Which award recipients have you read? I did like The Infamous Ratsos - that's the one I was happiest about this year :-). Like you, I do not get as excited about these awards as most people do. I was surprised at the number of honors March received, but given that the committees work independently of one another, I do not doubt they all came to those decisions through honest consideration. I was thrilled to see THE INQUISITOR'S TALE receive an honor; it was an absolute favorite of mine this past year, and my sixth grader devoured it and bought it for friends at the holidays. I expected WOLF HOLLOW to win the Newbery, but was so pleased when TGWDTM took the prize. I've read it aloud to my daughters three times this year (they are 7, 9, and 11.) Each time, we discover something new to love about it. I'd suggest you overlook the cliched descriptions and give it a read. I may read The Girl Who Drank the Moon at some point, but I looked at it in the bookstore today, read a couple of pages, and decided it doesn't need to be a priority right now. I was really looking forward to reading The Inquisitor's Tale but wound up being disappointed by its treatment of the Catholic church. I'm working on a detailed blog post that explains why I can't recommend it. Hi! I am eagerly awaiting your review on The Inquisitor's Tale because, like Katey Howes, it was my favorite "Newbery-material" of last year, next to The Key to Extraordinary by Natalie Lloyd. I didn't find that The Inquisitor's Tale had much toilet humor in it, aside from the farting dragon. Since you are a practicing Catholic your view of the book will be unique and quite different from mine, I'm sure. So I look forward to your review. The toilet humor ended up being secondary to the many religious issues I have with the book. I'm working on the review, so hopefully it will be published soon! I always watch the broadcast with interest and excitement, but unfortunately, I find it difficult to keep up with the new books anymore. I am interested in your take on the politics of the awards because I didn't know enough (shame on me!) to even think about it. Regarding Sarah Dessen, would you recommend her novels for my twelve year old daughter who is pretty innocent but also ready to move "up" in her reading? I'm probably more hung up on the politics than the average reader owing to ongoing political discussions I have been hearing about in the library world. I haven't been reading new books since the end of last summer, so this may be the last year I've even read enough of them to comment! Sarah Dessen's books are usually romances. Most are not sexual, but there is one about an abusive relationship (Dreamland.) That Summer, her first novel, is about a 15-year-old girl dealing with her dad's remarriage and the disappointment she feels over the boring guy her sister is about to marry. That would be the only one I would consider appropriate for a twelve year old. I was 15 when I started reading her and that seemed like the perfect age. Some of newer books have main characters who are graduating high school, so they skew even older.